Writing about choosing adoption as an eco-friendly decision is a touchy topic. I’ve thought about how to start this post for months: while I anxiously awaited to see the first picture of our daughter; while I lay in bed, jet-lagged but unable to sleep as the dogs and goats barked and bleeted at each other in the streets of Addis Ababa; and during the tortuously long weeks we waited for the U.S. Embassy to approve our daughter’s visa to enter into the United States. There were, of course, many reasons why we chose to adopt: the desire to be a multi-racial family, to give a home and a family to one of the 5 million children in Ethiopia who needed one, even an unexplained feeling since I was very young that adoption would be a part of my life. But truthfully, the environmental reason behind choosing adoption was a predominant one. Our population has exploded over the past few decades. People are living longer, which is, of course, a wonderful thing, but that’s not to say it isn’t problematic as well. I’m not a scientist, but I have serious doubts that our planet can sustain the abuse of 9 billion people (which we could reach by 2050), especially if we continue to practice the same environmental habits (or lack thereof). My husband and I had agreed early on in our relationship that if we were to have any biological children, we would only have one. We simply could not see a good enough reason to add another human being to this planet when there are already so many who need homes and families. I think it’s easy for us in the United States to shrug off this argument and get defensive: “Well, I should be able to have as many children as I want as long as I am able to provide for them.” We tend to get very frustrated when things that we see as our rights as threatened, which I think is a sign of a healthy, intelligent society. But I still want to pose a few questions: Is it the right of every child to have a family who loves and cares for him or her? Should we be able to have as many children as we are physically capable of, regardless of their impact on the population? What are the reasons in our society for not adopting? Exploring these questions with our families could lead to a more open-minded approach to considering adoption as an option during family planning. I’m not suggesting we institute a one child policy like China’s former rule, but I do think that people should remain open to the option of expanding their family through adoption. And we definitely need to STOP glorifying explosive reproduction such as Octomom and the Duggars (now pregnant with baby number 20!). Having the ability to reproduce should not mean, in my opinion, that one has as many children as possible. Even if we take it upon ourselves to raise thoughtful, environmentally concerned children, there are the simple facts of consumption. In Finding Aster: our Ethiopian adoption story, Dina McQueen’s memoir detailing her own journey to adopt from Ethiopia, she quotes the staggering statistic that, “In a lifetime, the average American will throw away 600 times his or her adult weight in garbage.” Another stat: According to a 2009 study, each child adds an estimated 9,441 metric tons of CO2 to a parent’s carbon legacy—that’s about 5.7 times his or her direct lifetime emissions. Of course, adopting a child instead of having one biologically does not completely erase those legacies, but it does create less of these environmental impacts simply because there will be less people making them. 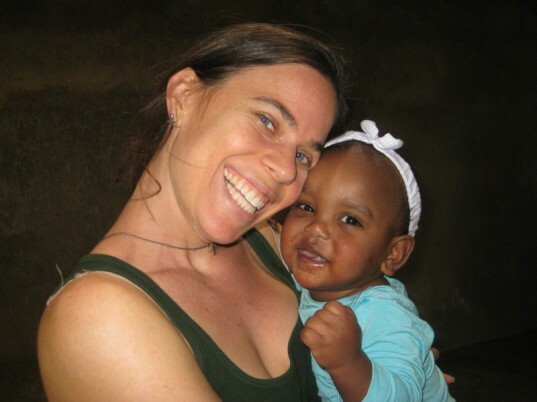 While volunteering in Ghana just after our wedding, I met a woman who had recently had a tubal ligation after her sixth child. She had only been able to have the surgery because it had been paid for by another volunteer, who had been moved by her story. In essence, the woman’s husband did not care that she did not want any more children and that she didn’t feel they could provide for the ones they had (including a very sick child who at over 2 years old was only the size of a 6 month old). The husband didn’t believe in using protection, and this woman knew she was doomed to spend the rest of her reproductive years birthing more children. She, like many women in patriarchal societies where women are born to breed, had very little choice in her own reproductive health. I feel unbelievably thankful that I am in charge of mine. I have felt a child grow inside my body, and I have experienced all the accompanying emotions-the elation of feeling those first butterfly wings of movement, the awkward sensation of being kicked in the ribs by some interior force who apparently needs more room, the intensity of the contraction by someone who is ready to meet the world. I didn’t experience any of this with our daughter, but as soon as I saw her picture, she felt as much my own as any child ever could. Throughout the months of adoption preparation, of home studies and fingerprinting, of paperwork and endless, anxious waiting, we fell in love with this little girl just as we would have if she were growing inside me. We are born into certain families and we create other ones-with our friends and our life partners. Creating a family through adoption was a logical decision for us, and I truly believe it should be more supported and explored by the general population. When people find out we are adopting, their knee jerk reaction is to ask if Elijah was adopted as well. The answer (no) is often very confusing to people: Why would we adopt if we were capable of producing children? The idea that adoption is a second-choice or a last-resort option is one that is pervasive and becoming less of a reality. I have to admit-even I fell for this prejudice. I imagined that many of the other couples in my adoption agency to be older and infertile and was surprised when in our first travel group that half of our group of eight had other biological children and had simply chosen adoption. Other couples had decided to start a family through adoption without trying first for a biological child. While this choice was not made for environmental reasons necessarily, the result is the same: being able to create a family with a new child to love, protect, and care for and the added benefit of not contributing another human to this planet. If this observation seems harsh, it’s because I truly do not feel there is a distinction between a child who is biological and one who is adopted. Having been on both sides of the coin I can honestly say for me, when I look at my children, it makes no difference to me that one shares my DNA and the other does not. I think one of the greatest things about living in this country at this time in history is that we have the opportunity to question, to experiment with ideas, to push ourselves and see how we respond. Even if you decide to have biological children, I think adoption should at least be considered when you are making your decision. Dina McQueen says, “If I can touch just one person, change the course of one family to include an adopted child, rather than giving birth, then I have done my job.” I feel the same way. Being green can be tedious at times: remembering to carry around our reusable bags, having to go out of our way to find certain eco-friendly products or services. But adopting a child into your family as part of living a green lifestyle, there is no sacrifice, no tediousness; there is only joy. In the oft-quoted words of Ghandi, “be the change you wish to see in the world.” I want to see a world where families are created in different ways and are composed of different cultures and ethnicities. 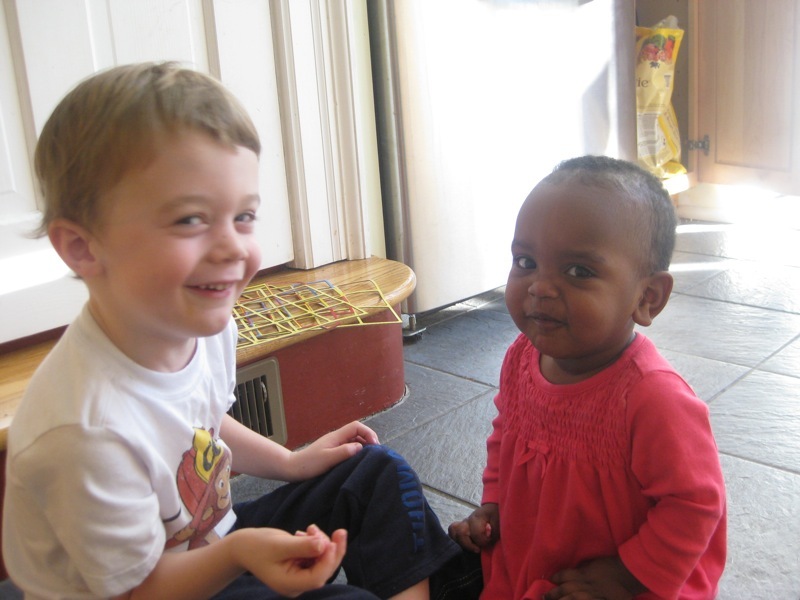 I want to see a world where orphaned children are integrated into families who love them and want them. And I want to see a world where adopting a child is so commonplace, no one even bats an eyelash. And when my daughter, when she is much older, asks why we chose adoption, I will tell her the truth, all the reasons why. It doesn’t change how much I love her. Not one bit. Your daughter is beautiful. My husband and I are just getting ready for the adoption journey. My whole life I knew I would adopt, and when I met my husband he was totally open to the idea as well. Like you guys, we said we would try for one and adopt one. We were lucky enough to have our biological son, and we hope we are lucky enough to bring home our next son or daughter. Ours we will be a domestic adoption due to finances, but nationality was not an issue for us anyhow. Thank you for your comments. As always, dialogue is best. To respond to some of your comments: Our decision not to adopt through the foster system was a complicated and personal one. I don�t feel it�s necessary to justify my reasoning to you, but I will say this: everyone has a certain level of comfort and capability regarding their parenting. I do not personally feel that I could adequately parent an older child who had been moved from home to home. We also had to keep in mind the needs of our own son, who would not do well with a child (or children) being placed in our home and then moved out after a length of time. While fostering a child is a wonderful option that we hope to explore when our children are older, it was also not the right time for us logistically-we moved halfway through the adoption process, so we did not feel comfortable starting the fostering process and then moving to another state. I also did not feel prepared to parent a child and then have them possibly taken away; it is my understanding and the experience of several friends that it can be extremely difficult to adopt a child within the foster system. Regarding whether it is eco-friendly, you are right. Had my daughter remained in the orphanage system, she would not have used many resources and would have had a minimal footprint. She would likely never have gone to school or ridden any form of transportation, public or private. She also would likely have died before she reached adolescence, which is what happens to many of these orphans in Ethiopia. The adoption program in Ethiopia is relatively new and definitely did not create the millions of orphans that currently exist in Ethiopia. Although our daughter will be raised in an industrialized nation, we will always strive to teach her our environmental ideals and encourage her to have a small footprint. Regarding the humanitarian issue: the aim of our adoption was to expand our family and to give our daughter a wonderful life. Maybe we didn�t change the poverty of her village or her nation, but we changed her life and will give her a better one. I don�t feel that it is my personal responsibility to save a country or even a village, though our family has been involved and will continue to be involved with humanitarian efforts in several places in the world. To say that we did �nothing� is to completely discount the value of her life. Regarding the costs of adoption: I don�t think it is any of your business how I spend my money. Would you tell someone who was spending $40,000 on IVF or other reproductive services that their money would be better spend digging wells or building schools? And regarding people adopting children within their own country, the rules, regulations, and costs are NOT the same as they are for international adoptions. Many of us who have adopted (I would say the majority of us) have a deeper, more vested interest (financial and emotional) in these countries. We have traveled there, met the people, etc: we are much more likely to build those schools and dig those wells that you wrote of, because we saw and experienced it with our own eyes. I think few of us have the �grab a child and bring them back to an industrialized nation and then corrupt them with our Western ideals� perspective that you seem to believe are so pervasive. Personally, I am committed to preserving her language and culture as much as possible: one of the reasons we moved to our specific neighborhood was because of the large Ethiopian population here. We are also committed to spending time in her country throughout her life. I would love for each country to be able to provide for their own children, and I applaud the efforts that are made regarding family planning as well as family support. But it simply is not possible in ever case. In the cases of several Ethiopian children who were adopted that I personally know, a mother tried to give her child up for adoption, was given funds to make it more financially viable to keep her family together, and eventually still chose to give up her child for adoption. The staggering number of people living in poverty in Ethiopia makes it impossible for them to care for their children. And let me also say that children with special needs are often completely shunned (if not outright killed) in many foreign countries. Corruption is a problem in international adoption, but I don�t think that shutting down adoptions completely is the answer. We have to be honest with the fact that some of these children are simply not wanted by their birth parents (or extended relatives) or that their birth parents are unable to take care of them. In the United States, when someone gives up their child for adoption, it may because they were too young, too unprepared, or simply do not want to be a parent. We cannot pretend that these same reasons don�t exist in other countries. I agree that it is completely unethical to have illiterate people sign papers and to exploit people for their ignorance, and many adoptive parents are working hard to make the process as ethical as possible right now. But I can assure you from personal experience that for some of these birth mothers, this is what they want for their children. I have seen it with my own eyes and heard it with my own ears. Not everyone is being hoodwinked-some know exactly what they are doing and have chosen to give their child up for an adoption because it is a chance for them to have a better life. Finally, regarding the nations that have ceased IA because of corruption and have had their orphan problem disappear, I would be interested in knowing the specific countries you are referring to. I am aware of several countries in Eastern Europe that ceased IA and now have A) a huge population of institutionalized kids who are not given proper attention, nutrition, or social interaction and B)a growing problem of orphans who become �of age� and have no supports or families. I strongly believe that IA can be made more ethical, more transparent, and also that we should help find ways to keep families together, regardless of the country in which they reside. Here�s to hoping that, despite feeling differently about international adoption, our passions will both lead us on a path to advocating for the children who so desperately need it. We are about to embark on the journey of IA and your article is one of the most inspiring ones I have been privileged to read online. Thank you for sharing, opening your heart, and giving those of us with a heart for a child a chance to feel empowered in our choice. 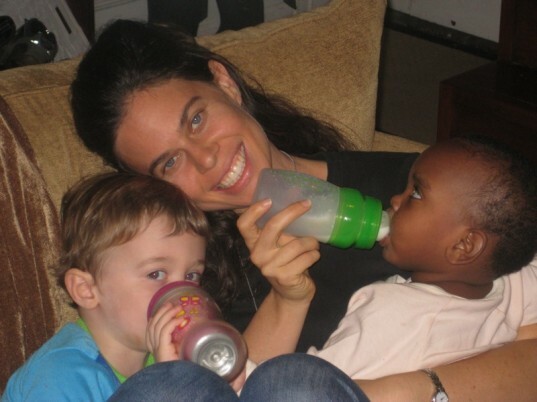 Those who have biological children and adopted say one thing...the love is the same. So this is a journey of love after all and I hope the IA system becomes more ethical and attainable for others over time. I’m not suggesting we institute a one child policy like China's former rule, but I do think that people should remain open to the option of expanding their family through adoption. And we definitely need to STOP glorifying explosive reproduction such as Octomom and the Duggars (now pregnant with baby number 20!). Having the ability to reproduce should not mean, in my opinion, that one has as many children as possible. Even if we take it upon ourselves to raise thoughtful, environmentally concerned children, there are the simple facts of consumption. In Finding Aster: our Ethiopian adoption story, Dina McQueen’s memoir detailing her own journey to adopt from Ethiopia, she quotes the staggering statistic that, “In a lifetime, the average American will throw away 600 times his or her adult weight in garbage.” Another stat: According to a 2009 study, each child adds an estimated 9,441 metric tons of CO2 to a parent's carbon legacy—that's about 5.7 times his or her direct lifetime emissions. Of course, adopting a child instead of having one biologically does not completely erase those legacies, but it does create less of these environmental impacts simply because there will be less people making them.